An outstanding type of filly by Champion sire, Not A Single Doubt! Out of a Charge Forward mare (Dam sire of 2017 Golden Slipper winner, She Will Reign & 2018 Golden Slipper winner, Estijaab). This athletic filly hails from the family of Group 1 winner and current hot second season Stallion, Wandjina. This filly was purchased from the 2019 Magic Millions Sale and is paid up & eligible for the rich Magic Millions Race Series! Not A Single Doubt is clearly one of Australia's premier stallions. With a strike rate of winners that is almost unmatched, he has produced the likes of Group 1 performers Secret Agenda, Fell Swoop & Single Gaze just to name a few. Such is the demand for his services, Not A Single Doubt now stands at Arrowfield for $99,000 along side his sire, Redoutes Choice. The dam hails from a strong, very successful black type family which include international Group 1 Sprinter Inspiration, Group 1 Galaxy winner Masked Party, outstanding 2YO Dracula & the very popular second season sire and Group 1 Australian Guineas winner, Wandjina. This classy filly is out of a Charge Forward mare, just as 2017 G1 Golden Slipper winner She Will Reign, 2018 G1 Glolden Slipper winner Estijaab & 2019 G2 Silver Slipper winner Time To Reign. See a pattern? She is bred on the same Redoutes Choice x Charge Forward cross as 2018 G1 Golden Slipper winner, Estijaab. Time To Reign is also bred on a similar cross. 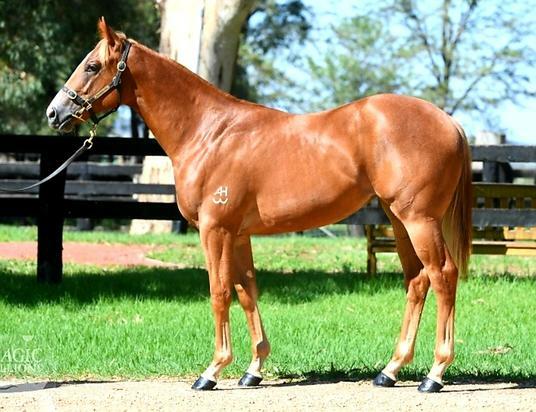 This filly was bred and sold by Corumbene Stud who also bred and sold G1 Golden Slipper winners Sebring & Overreach. Current Status: Completed her education at Bimbadeen Park. Progressed through the process with ease. An above average mover, gives a lovely feel just as her conformation and pedigree suggest. Below is footage taken of our Not a Single Doubt filly (chestnut with white blaze) working with a colt. She will be trained by Golden Slipper winning trainer Gary Portelli. Pre-sale x-rays and scope were performed by Dr. Brett Warren. This filly was found to be low-risk. A post-sale examination of the horse was also conducted and the report has been included in the partnership agreement. Shares will be sold in 2.5%, 5% & 10% increments. The share price of $8,598 per 5% share is inclusive of all sale expenses, breaking in & education cost, lifetime Magic Millions race series nomination, initial Golden Slipper and Golden Rose race nomination, death & mortality insurance and all related registration and Racing NSW syndicate fees until June 2019. Average upkeep for a 5% share is $50 per week over the course of the year. Further details on cost, communication & owner privileges can be found by clicking the 'FAQ's' link below. * 12 months interest free finance available to approved applicants. Hello, I'd like to know more regarding the horse 'Not A Single Doubt X Avanzar Filly' you have listed as available.